After Leo’s memorial we felt like we needed to get away as soon as possible, and after a couple of weeks at home, a few visitors and Rich going back to work, we couldn’t wait to get away. I’ll cut to the chase and save you the suspense by telling you now that we didn’t see them. When the skies were clear the lights weren’t active, and when they were active it couldn’t have been cloudier. For a hot minute I believed that Leo would work his magic for us but evidently the little tyke is having way too much fun up there… But there’s so much more to Iceland than just the northern lights. We flew direct from Chicago - an easy and very affordable overnight, 6 hour flight with IcelandAir. We had dinner in the airport and popped a sleeping pill as soon as we boarded the plane, so after a semi-decent sleep we touched down in Keflavik International Airport. It was still dark outside so we headed for the nearest coffee shop in arrivals for a caffeine hit and waited for the sun to rise before setting off to explore. Top tip: Booze is pricey in Iceland (well, in fact, everything is pricey in Iceland, but booze is heavily taxed) so stock up in the duty free in arrivals before you leave the baggage claim area! The Blue Lagoon is a must-do activity for anyone visiting Iceland and it’s located near the airport, so it makes sense to do it on your way in or out of the country. 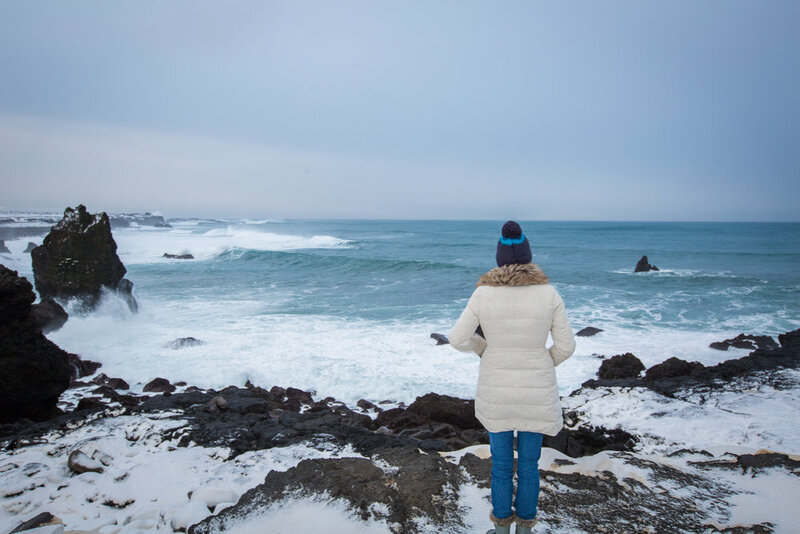 Having left everything to the last minute, the only slots available were at lunchtime on the day we landed so we had a few hours to kill in the morning and we decided to take the scenic route around the Reykjanes peninsula. Our first stop was the Bridge Between Continents - a small footbridge over a major fissure between the Eurasian and North American tectonic plates. I mean it’s pretty cool in theory but in reality it’s just a bridge between two little cliffs and doesn’t really warrant a detour. But if you’re in the area, jump out of the car, take a photo, tick the box and move on. Next up were the sea cliffs at Hafnaberg - the drive across the barren landscape along the coastline gave us a quick taste of the aggressive nature of the elements in Iceland! A piercingly cold wind was throwing 30ft swells across the rocks and as we passed a small fishing hamlet we wandered, who in their right mind ventures out into those seas…in fact who in their right mind comes here on holiday in February?! The views are breathtaking though and if you want to go somewhere to put your control over life vs the power of nature in perspective, this is it. Just 10 minutes outside on the exposed cliffs had us dreaming of warming up in some hot pools - time for the Blue Lagoon! Booking is required due to the lagoon’s popularity and the pricing goes up and down with demand, so book as soon as you confirm your flights to get the time slot you want at a reasonable price. 1-2 hours is enough time to spend there and personally, I think the comfort package is sufficient as the additional benefits you get in the premium package don't really seem worth it. All packages include a mud mask and a drink of your choice from the swim up bar - hellooooo prosecco! Don’t mind if I do! Top tip: Do not get your hair wet in the lagoon! They don’t tell you this but it makes your hair stick together! Luckily I’d be warned by a friend but I’ve heard stories of people having to get the chop because they didn’t know! Feeling suitably relaxed and refreshed, we made our way into Reykjavik in time for a late lunch and a roam around the city before dusk. Iceland’s capital has a very cool, resort-style vibe, full of funky bars, cafes and restaurants as well as cute shops and galleries. We wandered up the hill to the Hallgrímskirkja church - inspired by lava formations found across Iceland it’s an interesting structure to say the least - and bought a ticket from the gift shop to go up the lift to the very top of tower and gaze out to all 4 sides of the city. The views are pretty awesome so it’s well worth it. Back down at sea level, we also checked out the Harpa Concert and Conference centre - another striking piece of architecture - before meandering our way along the waterfront and into the old West Side of town for a well earned beverage. We stumbled upon the Sæta Svínið (Sweet pig) Gastropub which serves a huge range of local beers and pretty amazing looking food. We ordered a beer but abstained from trying the food as we’d made dinner reservations, but if we hadn’t I think we would have hunkered down for the night! Instead we decided to continue bar-crawling our way back into the centre of town before settling down at Rok. We’d booked this restaurant having wandered past it earlier because it had looked cute and cosy, and it turned out to be just that and the food was fantastic. Think Icelandic tapas style dining in a trendy, relaxed but buzzing environment. All of the dishes are designed to be shared and eaten family style and there was nothing we tried that we didn’t like. We sunk a bottle of wine and caught up like old friends. It was the perfect evening to kick off our trip.